Primatologist Jenny Lowe is studying bonobo chimpanzees deep in the Congo when she is caught in a deadly civil war that leaves a fellow researcher dead and his daughter, Lucy, orphaned. Realizing that the child has no living relatives, Jenny begins to care for Lucy as her own. But as she reads the late scientist’s notebooks, she discovers that Lucy is the result of a shocking experiment, and that the adorable, magical, wonderful girl she has come to love is an entirely new hybrid species—half human, half bonobo. Laurence Gonzales is the author of three novels and five books of nonfiction. His best-selling book Deep Survival has been published in six languages. Primatologist Jenny Lowe is studying bonobo chimpanzees deep in the Congo when she is caught in a deadly civil war that leaves a fellow researcher dead and his daughter, Lucy, orphaned. Realizing that the child has no living relatives, Jenny begins to care for Lucy as her own. 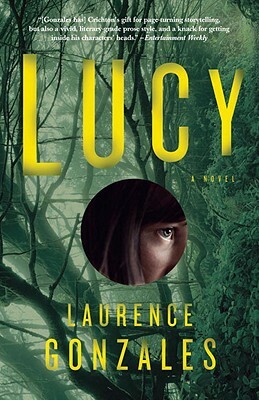 But as she reads the late scientist’s notebooks, she discovers that Lucy is the result of a shocking experiment, and that the adorable, magical, wonderful girl she has come to love is an entirely new hybrid species—half human, half ape.